Visit some of the greatest highlights of the world when you travel South America. When you travel to South America, there are a few things consider. Each country in South America has a special history and culture, along with it's own highlights and wonders. Action packed metropolises and quiet native villages are all found in South America. Hike the Inca Trail or climb the biggest glacier in the world in South America. Lacking lions or tigers, South America has its fair share of jaguars, llamas and penguins. 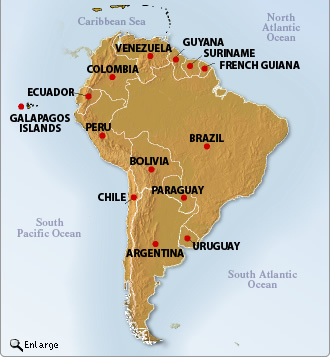 All About South America Travel is your complete English language guide to South America on the Internet. All About South America Travel has information and many links to other sites that provide valuable travel guides related to Countries of South America, including Argentina, Brazil, Chile, Peru, Ecuador, Colombia, Venezuela..
Travelers, businessmen, and even students doing a paper on South America, are sure to find a great plethora of useful information about South America on this site. Even if you are looking for the perfect beach resort, a cultural excursion, or family vacation, you will find our guide quite useful.